August 06, 2014 - "Blog"
Three channel Vector leak tester can save your garage floor! If you’ve been in the market for a home at some time and have considered an older, well cared for house, say something built in the ’70s did you notice the oil spots on the garage floor? Growing up in the seventies one of the joys of independent teenage travel a.k.a car or motorcycle ownership was taking care of your machinery. Some of us were better than others and appeared to know what to do, the rest just winged it. But one thing we all knew how to do was to put newspaper or “spill-dry” under the leaky bits. No big deal. It didn’t mean there was anything wrong with the motor or transmission – they all leaked. Just keep a can of oil in the trunk. Can you imagine that nowadays? My neighbor’s home has a garage floor that would shame the smartest restaurant! 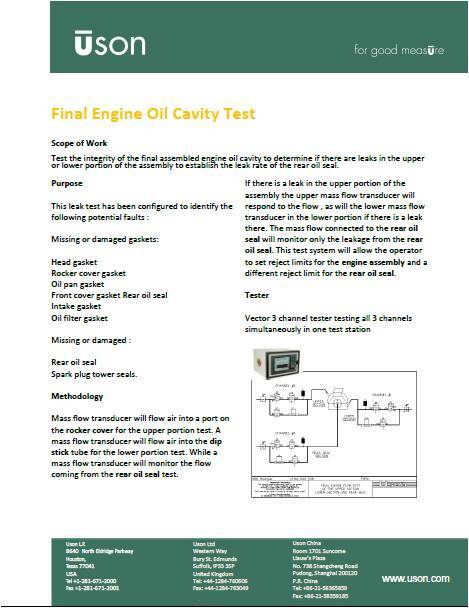 This brings me to the subject of this week’s post, the engine oil cavity leak test. Missing or damaged spark plug tower seals. To perform the test we will use a three channel Vector leak tester with all channels supporting a mass flow transducer. One channel will flow air through a port on the rocker cover (upper portion), the second channel will flow air through the dipstick port (lower portion) while the third will monitor air flow from the rear oil seal. If there is a leak in the upper portion of the assembly the upper mass flow transducer will respond to the flow , as will the lower mass flow transducer in the lower portion if there is a leak there. The mass flow connected to the rear oil seal will monitor only the leakage from the rear oil seal. This test system will allow the operator to set reject limits for the engine assembly and a different reject limit for the rear oil seal. To save time and minimize real estate requirements for the system, all three tests are performed simultaneously.